Ok! Two down, two (maybe three?) more to go! In all honesty, Zen's hair is a layered artistic mop (no offence Zen >__< I still adore you!)! I tried my hardest to simplify it... but it still took a long time to hand sew every layer on =< my poor fingers! I had to fully line his white jacket to stop the black clothes underneath from showing through. Sorry I'm keeping this guy, but I will have a commission spot for him soon, so people can order one from me. Thanks for liking him! thank you so much!!! Oooo, I wonder who that could be! 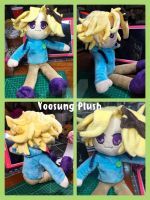 It'd be a huge honour to plush for you!! Aaaaaa these are amazing! Will you ever have these for sale? 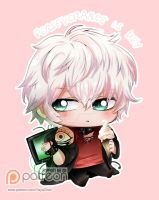 Aha it's no problem really, seeing as my favorite character is Zen, I'll be sure to start saving so I can get a plush of him. You've got a great talent and these look so amazing! Great job again. So where do I throw money to get this? LOL. This is seriously so cute. Your plush are some of the best MM ones I've seen ;o; <3 I can't wait to see Jumin! thank you so much!!!! x) so happy you like him!!!! Yay!!!! Thank you so much! 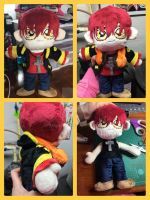 He was fun to plush! so cool! these are just so impressive, and really represent the characters. oooooh.... I look forward to Jumin. He is one of my favorites. But it is hard to pick a favorite lol. You're right! It's hard to choose a favourite! I'm still not 100% sure myself! Wow that's a lot of beautiful hair!! So cute I just love it!